Mach3 is the software that turns your computer into a CNC machine controller. If you’ve found this page because you can’t get your machine to work then I hope this helps you. If after trying the settings I’ve used it still doesn’t work correctly then please contact me and I’ll be glad to help. I get quite a few questions from all over the world. 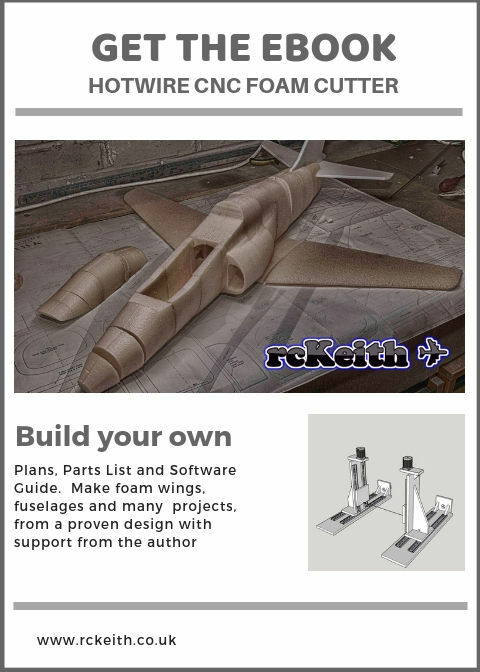 and I’ve made several wings and a fuselages check out these pages on the site Flying Wing and Hurricane. It took me a while and I had to draw information from several sources. There’s quite a lot of information for 3 axis routers but when you get to 4-Axis there isn’t as much. So I decided to document my own TB6560 setup for my own reference and help others as I’ve had some great help from people on the internet. 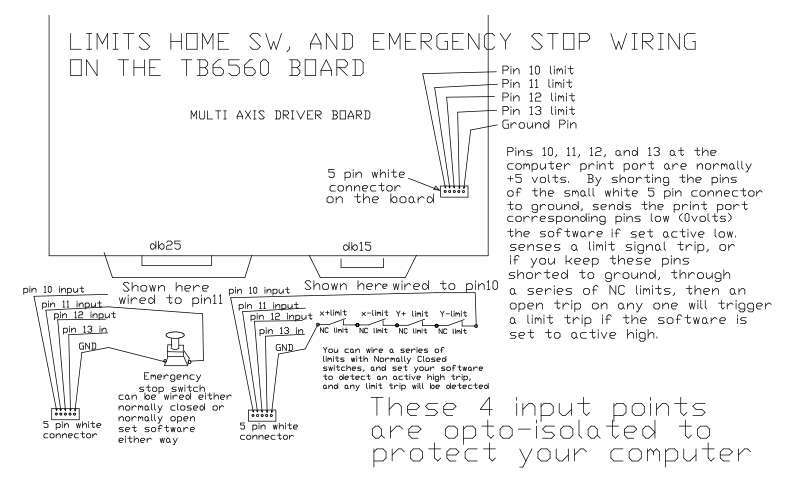 I’ve also used the TB6560 4 axis board for my OX 3 axis router from OpenBuilds. You see some negative comments about the TB6560 but I must say I’ve had no issues with mine. The only thing you have to do is spend a bit more time on is the instructions which usually aren’t the best. I’ve also built my machine from a lot of recycled parts to help keep the cost down, I hate waste. I did work in IT(retired now) but started out as a motor mechanic so I have both practical and computer skills. I’ve designed it so when not in use I can dismantle it and put to one side. I only have a small workshop, the whole setup can be pushed into a small corner when I need the space to build. I’ve had a few emails asking about which configuration I have my axis in. So I’ve taken a picture which explains it much better than words. I’d recommend watching the tutorial videos from the Mach3 website http://www.machsupport.com/videos/ the first 4 are good to get you going. Mach3 can be a bit overwhelming when you first start it up. It has lots of options which for hot wire foam cutting aren’t needed. The terminology can be a bit of a challenge if this is your first time e.g. DRO, MDI If you watch the interface video its all explained. Mach3 will only work on a 32bit version of Windows form 2000 to Windows 8 and you need a PC with a printer port. If your PC doesn’t have one then an add-on card can usually be used without any problems Check my post here to make sure you get the right type. I use Windows XP on an old Dell GX620 ussf I got from eBay with 2GB of RAM. Don’t use a laptop ArtSoft doesn’t recommend it due to the power saving features used on laptops, which can cause missed steps. My PC was a fresh install and nothing else on it. It’s not connected to the internet so I have no need for anti-virus and updates. I’ve even switched lots of unnecessary services off. I get the g-code on by USB memory sticks. The small 5 port ribbon connector on the controller is used to connect all the switches in series. As I used RJ45 LAN cables with 8 wires I was able to use the 2 of the 4 spares to get the inputs back to the controller board without any extra wires. 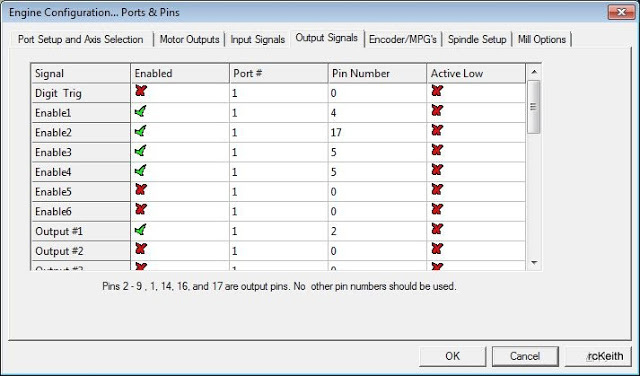 Mach3 is clever enough to know which axis the input relates to. This confused me a bit a first but it works. If you press REF ALL HOME each axis should home. It goes to the switch and then as it trips it reverse and comes off. I had a problem with this to start with. 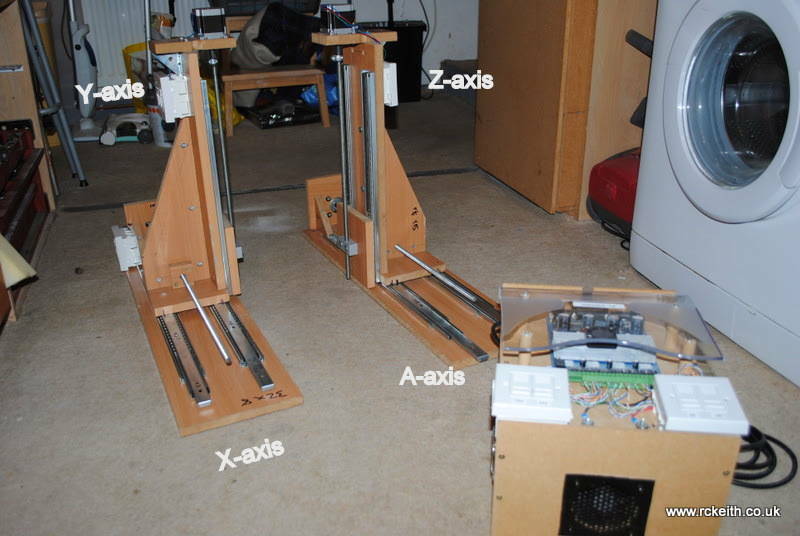 The X axis would trip the home/X – – switch and just stop. I posted this on the Mach3 forum and within a few minutes, I got some help. Posted the config file and a guy called “Hood” had the answer after I explained what was happening to the X-axis. It was being caused by some interference from somewhere (switches were all new). In the general config page, there is a setting called “debounce”. I put in 200 as “Hood” suggested and it worked perfectly. 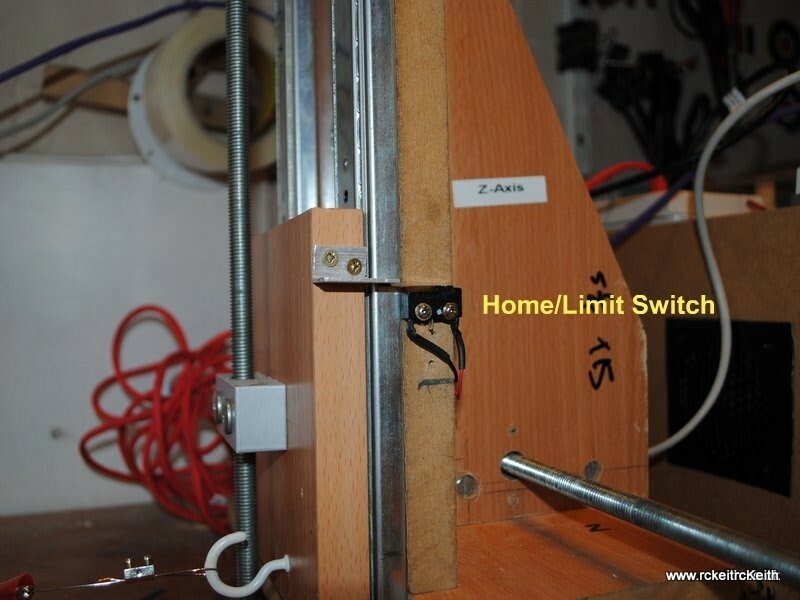 The switches are for safety and returning to the same home position. I also screw the towers securely down onto a longboard to stop any spring tension on the wire from moving them. I have a width of 44” and X travel of 16” and a Y of 11 “. I use Mach3 to drive the machine and Profili2 to design the wing panels and generate the g-code. This was the part where I thought I would need to do some tricky maths to get the axis to move the correct distance when a command was sent. Let me explain with an example. This line of code says to move the X and Y axis to 1 inch from the zero setting. (G20 means work in inches). So when Mach3 sends this to the machine it should move 1 inch. But that also depends on the thread used on your lead screws and the number of steps the motor makes. There are some details in the Mach3 documentation on how to do this, but Mach3 has an easier way. Select Steps per Unit and then the X-axis ( you can use any axis). When the dialogue box appears and says “How far would you like to move” enter a distance e.g. 1.0 then the axis will move. When it stops and says “How far did the axis move? 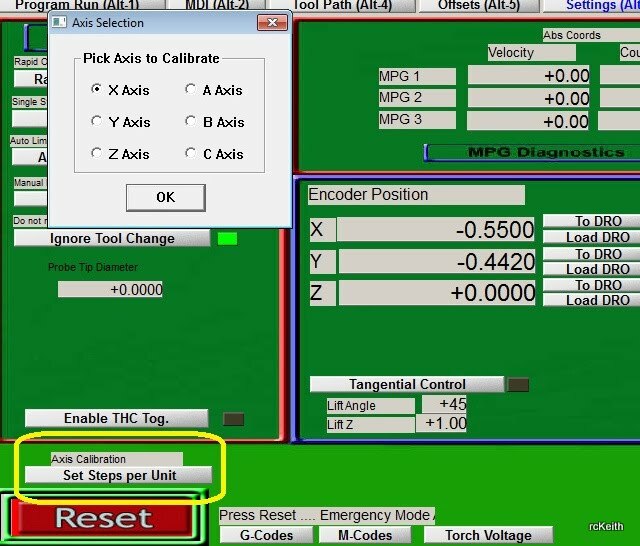 (Measure Value)” then measure with the vernier calliper and enter the value. 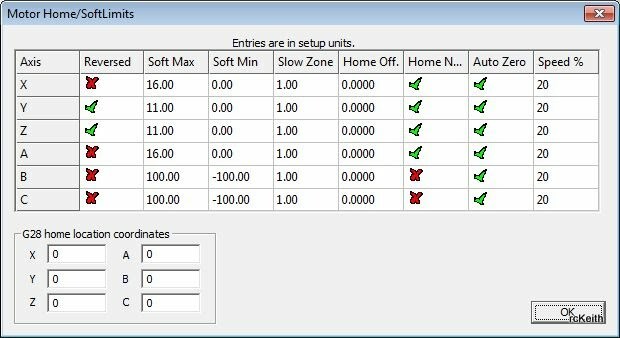 Mach3 will work out the steps per unit and save you having to do all the maths. Maybe worth doing this a couple of times. For hot wire foam cutting this is good enough, but if this were a router or mill the accuracy may not be acceptable. I use an iCharger 206B to power my wire and I did use 0.8 MIG welding wire. I’ve found that a feed rate of 96 works OK in the g-code. The power to the wire depends on the foam used. For pink XPS I use 4.1 amps, white foam a little less. For tapered wings, you need to adjust the kerf value ( this is how much foam is melted by the wire) at both root and tip. Profili2 Pro has this option, but it’s a bit trial and error. [March 2014] I’ve now found much better results with very thin wire. I’m using some that’s about 0.5mm and 2.6 amps on my iCharger with a feed rate of 115 in Profili2 and DevFus Foam. This now makes very good pieces. The hardest part of CNC is by far the software if you can’t get it working. I now have a CNC router and 3D printer which all work really well but you just have to put the time in and build your knowledge. At first, it seems too much to take in but stick with and seek help on the internet there are some good resources out there, the CNC forums have helped me many times. 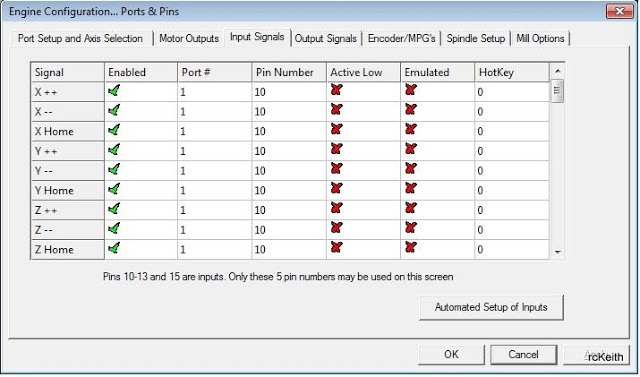 Mach3 isn’t the only solution to control your machine. Check my post http://www.rckeith.co.uk/free-cnc-software-3-and-4-axis/ if you can’t afford the license cost. I have managed to cut my first sample cut, turns out the problem I had earlier is only some setting problem that I didn’t enable all axis, the controller I have is 5 axis. I did a try cut with around 2.5inch thick white foam, using awg24 (0.5) nichrome and using 2A with 14v. The result is not so good, but I am still happy that it does works 🙂 Thank you so much for the plan and wonderful explanation that you gave thru the build log, it really helps. I am sure the power setting I am using is too large for such thin foam, and local white foam here is less dense. Do you think I should just try bigger foam piece or another thin piece with lower wattage. Try adjusting the feed. It may be you wire is not moving quick enough. It does take some time to get right. Glad you have it working, well done. A tip for good surface is to have a heat/spead setting so tha the wire never touches the foam but gets close. Let the radiating heat melt the foam away. I’m not by my machine right now but i think i cut at around 100mm/minute having the heat as low as i can go without ever touching the foam.